Light: Calmly expressing a dissenting opinion. Allowing someone to use his or her own methods to get a job done. Opening the floor for discussion or debate. Comparing progress made so far to standards set earlier. Shadow: Berating others for their ridiculous opinions. Picking fights. Offering destructive criticism. Baiting people with barbed remarks. Disrupting progress with an endless stream of pointless objections. Relationships. Every relationship has its ups and downs; no two people can be together for any length of time without some friction. Without making things personal, air your grievances. Share how you feel. If you feel a confrontation coming on, ask yourself what triggers it and why. Work. If your workplace lacks harmony, getting things done requires far more time and effort. Create an atmosphere where people feel free to share what they really think. Avoid the blame game; talk in terms of what should happen…and what happens when the system breaks down. Spirituality. It’s easy to feel spiritually connected when meditating in a tranquil garden. But how can you maintain your balance when surrounded by emotionally-charged chaos? Remember: you are not your emotions. Withdraw. Breathe. Save anger for those few transgressions worthy of such a powerful emotion. Personal Growth. What makes you angry? How do you respond when you loose your cool? Going berserk isn’t the answer. Swallowing your feelings won’t work either. Find constructive, level-headed ways to say what you need to say before you reach the boiling point. Fortune Telling. Prepare for a fight with your best friend. Remember: once you let words loose, you can’t take them back. When? Between July 22nd and August 1st. The Five Figures. In RWS-inspired decks, five figures confront each other, Wands in hand. Are they fighting? Are they dancing? Are three watching while the other two battle to the death? Waite claimed the youths could be engaged in either sport or strife—or even a “sham fight.” It’s worth asking whether or not your conflict, represented by this card, is the problem…or just a symptom. Meekness as an Alternative. How might meekness (as opposed to confrontation) work in your situation? How might changing yourself change the outcome of this particular battle? Your Contribution to the Clash. We’re quick to see the errors of others, but slow to understand how our own actions might contribute to confrontations. How have your actions contributed to the crisis? The Marseilles Image. 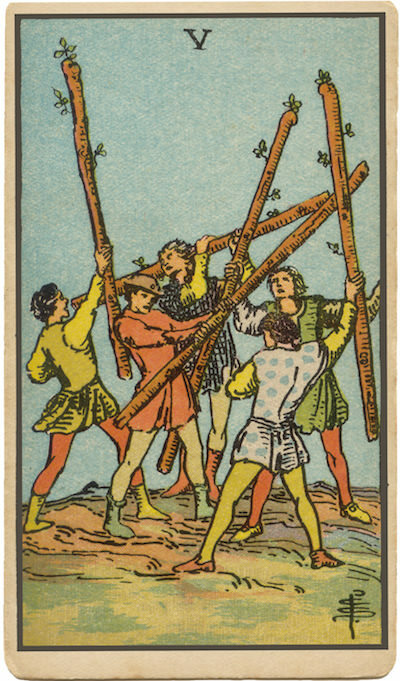 Remember the stable Four of Wands? Now, someone comes along and thrusts an intrusive new Wand into the mix, shattering the delicate balances that gave rise to celebration. Will you let the Wands topple … or work to restore balance somehow? To what extent is your current issue worth fighting for? What alternatives are there to outright conflict? What happens in a “fair fight?” How can you keep this fight fair?